My loves, to your left feast your eyes on L.A.M.B. 's ever-fabulous Pilot; to the right place your pretty peeper’s on Type Z’s sassy Strike. While the Type Z tantalizers feature a 4" heel and 1 1/4" platform, as opposed to the 4 1/2" heel and 1 1/2" platform of the luscious L.A.M.B. 's; for a mere $65.40, in comparison to the $325.00 needed to take the lovely L.A.M.B. 's home, they are every bit as glamorous of a choice for the cheap chica – and allow one to indulge in all three fabulous shades (black, cognac, and grey)! Thanks to Zappos and 6PM for the pictures. thank goodness there is a cheaper version. 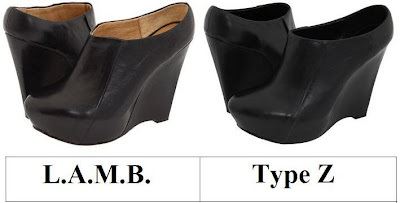 I think I'd have to go with the Type Z, just to cut down on the heel height a little, for my walking comfort. I think I would go with Type Z here. Wow, these are almost exact replicas! What a great find! They are such cute shoes... I totally need them. I'd probably go for the cheaper ones... love them! Beautiful, they look almost identical! they look so similar...i'll go with tightwad! They're almost identical! I will definitely save on this one! Wow, I'd totally save on this one! 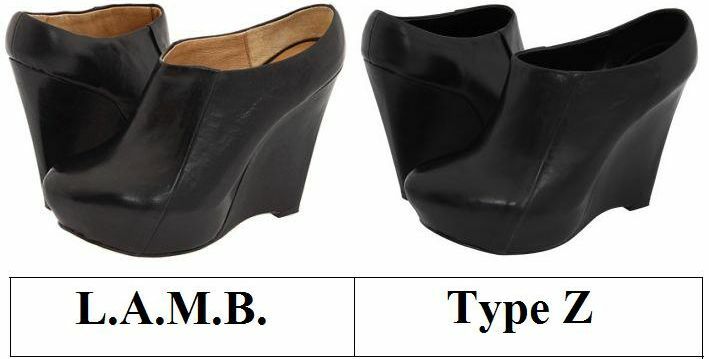 Personally I don't like either, but if I had a choice than the L.A.M.B ones because they just seem more fabulous! Wow what a great bargain! you CAN HARDLY TELL A DIFFERENCE IN THE LOOKS BUT BOY WHAT A DIFFERENCE IN THE PRICE! Another amazing pair of kicks. I would take either. But of course, I am partial to the cheaper ones. I always seem to go with the cheaper one, but they look so similar, and I'm cheap. I would probably fall in them but I would look fab doing it. Totally gorgeous! Wow, I love the cheaper version. wow that's definitely a steal at $65!! awesome!! Ugh, they are both incredible! But of course, I'd definitely have to get the budget friendly Type Zs! Those would look awesome in cognac! Cute look -- a little trendy for me to drop too much on it, so I'll go with the Type Zs! this blog is so great i love it! I really like the Strikes instead of the Pilots because of the darker interior and the higher heel. Thank you so very much, E, for helping me shop better. LOL. I would spend so much money if it wasn't for you. I love wedges. They are the perfect shoe. I defintiely perfer the L.A.M.B. ones. I probably wouldn't wear either--too clog-esque for my liking. Tight wad all the way! They look super comfy and dare I say slimming. Tightwad all the way 'coz they look so similar. Such a fantastic find! These shoes are so similar! I'm going to go with the Type Z today! The Type Z price is far closer to my budget.. however the LAMB lining looks sooo luxe and beautiful. Wait till you see them in person...definitely won't look the same. Definitely the L.A.M.B.! I will be a Tightwad! they are identical, why spend the x-tra cash? ... love wedges, love them and these are soooo cute. Erika those shoes are so badass! I want I want! Whoa, Erika, I totally can't tell the difference between the two (aside from the color of the inside of course). Amazing! I love the shape of them. I am not allowed to buy shoes right now (!!!) but as soon as I give myself some leeway (Valentines Day maybe? ha) I might have to check the cheaper version out. They are hot! They look identical! I really cannot tell the difference - I'd definitely go for the cheaper pair. Think i love them both. I love platforms. They are soo cool! first time seeing these boots ! and type z has got almost the exact replica of it ! I don't really like this style...so I can't really say. Yes! This is a fab find! Thanks for sharing!